In this week’s study from Tehillim / Psalms 144:1-15, the psalm opens saying, א לְדָוִד | בָּרוּךְ יְהֹוָה | צוּרִי הַמְלַמֵּד יָדַי לַקְרָב אֶצְבְּעוֹתַי לַמִּלְחָמָה: ב חַסְדִּי וּמְצוּדָתִי מִשְֹגַּבִּי וּמְפַלְטִי לִי מָגִנִּי וּבוֹ חָסִיתִי הָרוֹדֵד עַמִּי תַחְתָּי: 144:1 Blessed be the Lord, my rock, Who trains my hands for war, And my fingers for battle; 144:2 My lovingkindness and my fortress, My stronghold and my deliverer, My shield and He in whom I take refuge, Who subdues my people under me. (NASB) The Lord is all of these things for His people. David said the same thing in Tehillim / Psalm 18:34 He trains my hands for war, so that my arms can bend a bow of bronze. (ESV) As we live our lives for the Lord, we can easily dismiss ourselves as having little use to God because sometimes we feel we have nothing to offer. When the Lord God of Israel appeared to Moshe and assigned him the task of telling the Israelites that He would deliver them from the Egyptians (see Shemot / Exodus 3:16-17), Moshe felt inadequate. He said to the Lord, “I have never been eloquent … I am slow of speech and tongue” (Shemot / Exodus 4:10). We are not certain what Moshe’s problem was, perhaps he had some kind of speech impediment? It was most likely that he was just afraid to do what the Lord was calling him to do. We are told in the Torah that the Lord God overcame his inadequacy by His power to strengthen him. God said, “Now go; I will help you speak and will teach you what to say” (4:12). What the Lord God is seeking from us is for us to following His plan, which means to walk in His ways before kings and nations and to bear testimony to His word and truth. The Lord will bring to completion what His will wants. The Torah tells us in Devarim / Deuteronomy 20:1-4 states “When you go out to war against your enemies, and see horses and chariots and an army larger than your own, you shall not be afraid of them, for the Lord your God is with you, who brought you up out of the land of Egypt. And when you draw near to the battle, the priest shall come forward and speak to the people and shall say to them, ‘Hear, O Israel, today you are drawing near for battle against your enemies: let not your heart faint. Do not fear or panic or be in dread of them, for the Lord your God is he who goes with you to fight for you against your enemies, to give you the victory.’ (ESV) We are given a promise about our enemies if we remain faithful to the Lord and to His word. The Lord promises victory and promises to strengthen our hands if we must go to battle. In this particular section of the Scriptures, we always think on the physical war that David was constantly engaged in. In the Tanach we read of the events that led up to war, nation against nation where the enemy was always seeking the occasion to destroy David and divide the people of God (Israel). Today, we are involved in a war for both the mind and soul. There are many ways in which this world seeks to destroy us at a spiritual level. Spiritual struggles work on each of us in different ways. Sometimes the battles in this life go on too long, or are too hard, which can cause even the strongest person to begin to doubt the Lord God in heaven. Sometimes the enemy will bring a person to sow seeds of doubt and insecurity in our mind. The Lord on the other hand will bring people into our lives to bless us and to strengthen us. The true battle that we have however is against the spiritual realm that has set itself up against us in an attempt to destroy our faith and to mar our faithfulness before God. In the parable of the sower, Yeshua mentioned there was some seed that was eaten by the birds. Here Yeshua is speaking of a truth that when we begin to serve the Lord the enemy will come and attempt to eat up (destroy) what we are trying to do for the Lord. We have to be prepared for this truth, and this is why David seeks the Lord saying, ; חסדי ומצודתי משגבי ומפלטי לי מגני ובו חסיתי הרודד עמי תחתי 144:2 my faithful one, my fortress, my haven and my deliverer, my shield, in whom I take shelter, who makes peoples subject to me. (SF) We seek the Lord’s help that the work we do for the Lord is made secure and that the evil one will not steal from us what the Lord wants in our lives, to be joyful in serving him, to have faith, and to be faithful all the days of our lives in His Messiah Yeshua. David wrote that the gift of knowledge is out of God’s infinite storehouse and that the Creator’s knowledge has been revealed in His creation night after night (Tehillim / Psalms 19:2). This means that God’s vast knowledge is on display each day in his creative power to be seen by all and to remind us of “Oh the depth of the riches of the wisdom and knowledge of God” (Romans 1:19-20, 11:33). Paul also writes “Christ, in whom are hidden all the treasures of wisdom and knowledge.” (Colossians 2:2-3) There is wisdom and knowledge in seeking the Messiah of God. Human knowledge, apart from God, is flawed. The Apostle Paul wrote that knowledge has little value if it is not tempered by love. (1 Corinthians 13:2) When one gains a lot of knowledge this tends to make one proud, just as Paul wrote, “Knowledge puffs up, but love builds up.” (1 Corinthians 8:1) Therefore, the pursuit of knowledge for its own sake, without seeking God, is foolishness as king Solomon wrote saying, “Then I applied myself to the understanding of wisdom … but I learned that this, too, is a chasing after the wind. For with much wisdom comes much sorrow; the more knowledge, the more grief.” (Ecclesiastes 1:17-18) There is something that is called “Worldly knowledge” which in Paul’s day was related to Ancient Greek philosophers Plato and Socrates. Paul urges us in relation to this, “Turn away from godless chatter and the opposing ideas of what is falsely called knowledge, which some have professed and in so doing have wandered from the faith.” (1 Timothy 6:20-21) In this context (Plato and Socrates) the belief was believed that the mind and body are made of different substances and the discussion was related to something that opposed God’s knowledge, of who he is, righteousness, holiness, and truth. If we are not seeking the truth, it is only foolishness. David continues in his Psalm saying, ה יְהֹוָה הַט-שָׁמֶיךָ וְתֵרֵד גַּע בֶּהָרִים וְיֶעֱשָׁנוּ: ו בְּרוֹק בָּרָק וּתְפִיצֵם שְׁלַח חִצֶּיךָ וּתְהֻמֵּם: 144:5 Bow Your heavens, O Lord, and come down; Touch the mountains, that they may smoke. 144:6 Flash forth lightning and scatter them; Send out Your arrows and confuse them. (NASB) ז שְׁלַח יָדֶיךָ מִמָּרוֹם פְּצֵנִי וְהַצִּילֵנִי מִמַּיִם רַבִּים מִיַּד בְּנֵי נֵכָר: ח אֲשֶׁר פִּיהֶם דִּבֶּר-שָׁוְא וִימִינָם יְמִין שָׁקֶר: 144:7 Stretch forth Your hand from on high; Rescue me and deliver me out of great waters, Out of the hand of aliens 144:8 Whose mouths speak deceit, And whose right hand is a right hand of falsehood. (NASB) Those who are in the nations do not know the Lord God or His righteous ways. They deal falsely and harshly with God’s People. David speaks of the Lord rescuing him from great waters and from the hands of the enemy. Ibn Ezra on Parashat Beshalach (Shemot / Exodus 14:13) states the following in regard to the deliverance the Lord provided for the people at the Red Sea. Stand and see the deliverance of the Lord: Since you will not make war on Egypt. Rather you will see the deliverance of the Lord that He will do for you today. One may wonder how [such] a large camp of six hundred thousand men would be afraid of those pursing after them. And why did they not fight for their lives and for their children? The answer is that the Egyptians were the Israelites’ masters. And [so] this generation that went out of Egypt learned from its youth to tolerate the yoke of Egypt and had a lowly image. And [so] how could they now battle with their masters? And Israel was [also] indolent and not trained in warfare. Do you not see that Amalek came with [only] a small group and were it not for the prayer of Moshe, they would have overpowered Israel. And the only God, ‘who does great things’ and ‘for whom all plots are contemplated,’ caused that all the males of the people that went out of Egypt would die. As there was no strength in them to fight against the Canaanites, until a new generation, after the generation of the desert, arose. And they did not see exile and they had a [confident] spirit, as I mentioned in the words about Moshe in the Parsha of Eleh Shemot (Ibn Ezra on Exodus 2:3). Ibn Ezra comments on Moshe’s words “Stand and see the deliverance of the Lord,” saying that the people will not need to do a thing, the Lord God Almighty will fight for His people. This appears to be what David is saying in regard to the Lord God almighty and his faith that the Lord will stand for him and deliver him just as He had done in the past for the children of Israel. The enemy has the advantage of making God’s people feel small and unable to fight back. The commentary asks the question why the people felt unable to fight being 600,000 men strong. It was because of the low image they had since Egypt was there task masters. Ibn Ezra concludes saying that a new generation of godly fighting men needed to raise up before entering into the Promised Land. The reason being, a generation of people being raised to know the Lord were much stronger than the previous generation, they had the ability to fight, to overcome, and to have faith in the Lord God in heaven. התיצבו וראו “stand still and see!” Perhaps Moses suggested to the Israelites to stand still in prayer now just as they had stood and prayed in verse 10. We find the expression “standing still” also in connection with Hanna’s prayer in Samuel I 1,26. אשר יעשה לכם היום, “which He will work for you today.” G’d emphasized the word “to-day” because He did not want the people to worry that Pharaoh’s punishment would be as long delayed as it had been in Egypt when it took 12 months from the time they first heard the news that Moses would be the redeemer. אשר ראיתם את מצרים, “the way you have seen Egypt, etc.” G’d explained that the reason He had allowed the Egyptians to assume such a threatening posture was only because they would never again assume a threatening posture such as this. The Egyptians would soon collapse in spite of their fear-inspiring guardian angel. The comments from the rabbis here speak of standing in faith and prayer. A parallel is made in the sense of complete helplessness (1 Samuel 1:26). Hanna was childless and only God could grant her a child by the power of His Word. Here Hanna is completely relying upon the Lord for help. Similarly we find the people at the Red Sea doing the same, and David asking for the Lord in prayer and song to help him overcome the enemy. Rashi comments on “you will see them today” and says but will not see them any other day because I (God) will destroy them. Rashi says this is a command from God to not see them again just as there is a command not to return to Egypt. His conclusion is that “Rather, we must say it is not a command but a promise that “You will never again see them” because they will all drown in the sea.” The point is we are able to go to the Lord and request His help because He is our God! The Psalmist repeats what he says saying, יא פְּצֵנִי וְהַצִּילֵנִי מִיַּד בְּנֵי-נֵכָר אֲשֶׁר-פִּיהֶם דִּבֶּר-שָׁוְא וִימִינָם יְמִין שָׁקֶר: 144:11 Rescue me and deliver me out of the hand of aliens, Whose mouth speaks deceit And whose right hand is a right hand of falsehood. (NASB) The one who is deceitful has taken his right hand, the place of power in his life and filled it with falsehood. Paul wrote in Galatians 6:7 which says “Be not deceived God is not mocked, for whatsoever a man soweth that shall he also reap?” For the man who sows deception, he will also reap deception. This may be why for those who live deceptive lives are always thinking the other person is trying to deceive them. The Lord God Almighty has given us a way of escape. Paul wrote in 1 Corinthians 11:31 saying, “For if we would judge ourselves, we should not be judged?” So the basic concept here is we are to be critical of ourselves and not others. This means that we are to treat people right, and allow the Holy Spirit of God to work in our lives to root out evil. Sure we are also called to talk to others about sin and deceit, but God is ultimately the judge and not us. So when dealing with others, we should sow good seeds, the kind that blesses rather than condemns. לאליפז הראה לדעת, כי שיתייסר הצדיק על חטא קטן הוא סותר לתכלית בריאת האדם שהיה בעבור השגת השלימות, וגם שבירר ממקרהו שהוא צדיק אובד. He clearly proves (Deuteronomy 4:35) to Eliphaz that if a righteous person is made to suffer for some small sin, the very purpose for which man was created, viz. the attainment of perfection, is negated.Besides, his own case was one of a righteous man who had perished completely. שיטת בלדד הסתומה חקר על חמישה אופנים, וכל החמישה פנים היו כקצף על פני מים מפני תשובותיו. He demolishes Bildad’s arcane theory in five different ways, each like surf breaking upon the water (Hosea 10:7), על הפילוסופיא של צופר לעג לעג הרבה ויוכח כי שכל האדם נברא באופן שישיג השגות ברורות, ושהשגותיו החושיים הם ההשגות האמיתיות, וכן הם עצמי הדברים, ולא נברא האדם שיילך שולל כחולם בעולם הדמיון, כי הוא אזרח בעולם המציאות, וחלילה לבוראהו שיבראהו לצחוק ולמשחק למשאת שווא וחזיונות הבל ורעות רוח (פתיחה למענה ג’ ה’ ז’). and pours great scorn on Zophar’s philosophy. He argues that man’s mind was created with the ability to attain clear perceptions; his sense-perceptions are real perceptions and are the essential qualities of things. Man was not created to be made a fool of; a dreamer in an imaginary world. He is a citizen of the real world. It is inconceivable that his Creator made him for a joke and a prank; for pointless burdens and hallucinations (Lamentations 2:14), emptiness and chasing the wind (Ecclesiastes 1:14). It is important to note how we were created with the ability to perceive the truth. The rabbis say that we were created to achieve perfection. The concept comes from the Garden of Eden and the creation of God as being very Good. At this point man was in the perfect state, without sin, and innocent of heart and soul. The commentary says that man was not created to be made a fool like a dreamer in an imaginary world. He is a citizen of the real world. This observation reveals to us that we have to be aware that it is possible to create in our minds an alternate reality and this may occur slowly even not being aware that this is happening, as this involves the various inputs that we put into our hearts and minds. (Culture, television, Internet, news, etc) We have to be very careful to guard our hearts and minds because we are capable of being deceived very easily. May Adonai deal kindly and graciously with you! Here we hear the Priestly Benediction at the most sacred points in our lives, such as at circumcision, the naming of a newborn child, and when bringing a child beneath the chupah. We also hear the Priestly Benediction during the Pilgrimage Festivals and the High Holidays. The simplicity of this blessing points to the deep spiritual implications and also of this physical world, the Lord cares about all of who we are to bless us in this world and in the world to come. David’s Psalm ends speaking of this aspect of God’s blessing upon His people. That are sons and daughters be raised to know the Lord and to be planted firmly in the ground. According to the rabbinic imagination, even God prays saying, “May it be My will that My mercy conquers My anger and dominates My attributes, that I behave compassionately towards My children, and that I go above and beyond the call of duty in relation to them.” (Babylonian Talmud, Berachot 7a) This teaches us something about who God is and His passion for His people. In a similar manner, we are to be as passionate about those around us and for the Lord God Almighty and His Messiah Yeshua. Let’s Pray! 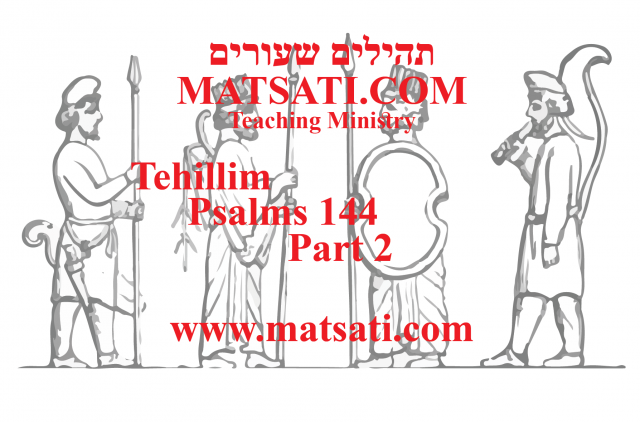 The Rabbinic Commentary (Midrash) on Tehillim / Psalms 144 has 1 part. Reading through the Midrash we will be looking at Part 1. Let’s begin by outlining Midrash Tehillim Chapter 144, Part 1. The משל (mashal) “the parable,” goes on to explain the פתיחתא (Petihta), the rabbis ask the question what does it mean to in all your ways acknowledge the Lord? The נמשל (Nimshal) “expansion on the parable” expands upon the משל (mashal), the rabbis say it was not by our own hand that we acknowledge Him because without God’s help this is impossible. “[Incline] your heart to understanding” (Mishley / Proverbs 2:2). “Raise your voice for understanding” (Mishley / Proverbs 2:3). “Understanding will guard you” (Mishley / Proverbs 2:11). “Blessed is the one who . . . gets understanding” (Mishley / Proverbs 3:13). “Wisdom rests in the heart of a man of understanding” (Mishley / Proverbs 14:33). “The heart of him who has understanding seeks knowledge” (Mishley / Proverbs 15:14). “To get understanding is to be chosen rather than silver” (Mishley / Proverbs 16:16). “Buy wisdom, instruction, and understanding” (Mishley / Proverbs 23:23). Solomon states that we are to acquire understanding. The point he was making was not to lean on our own understanding, meaning the conclusions we make are based primarily upon our own perceptions. The reason being, our own understanding is not an adequate sampling of reality. The Midrash is opening with David’s Words saying “Blessed be the Lord, my Rock, who trains my hands for war, and my fingers for battle (Tehillim / Psalms 144:1).” Without the Lord’s help, victory is not assured in this life, especially in times of war. The Lord is the One who causes us to have victory, to be more skilled and trained than our enemy. This is an important point to remember placing the Lord God first in our lives, to seek His will and gain His understanding according to His Word. Note how Adam and Eve handled the choice of eating from the tree of the knowledge of good and evil. They leaned on their own understanding which led to sin. In order to truly handle the knowledge of good and evil, one must possess the ability to comprehend all possible options and contingencies of our choices and have the righteousness and wisdom to choose the right course. Only God has this ability to do so, and He has the power to make our reality conform to the right course of action, which is why we are to seek His help in our lives. What this means is that it is the one who trusts in his own understanding that is irrational. The only rational one is he who puts his trust in the Lord! It is the Lord God in heaven who has unlimited understanding and we have access to this by His Spirit that indwells us. א לדוד ברוך ה׳ צורי וגו׳. אמר שלמה בכל דרכיך דעהו (משלי ג ו) מהו בכל דרכיך דעהו, הוי ניתנו בלבך לפניך בכל דרך שאתה הולך, כשם שהיה דוד עושה, היה מלך ואמר איני מלך, הוא מלך והוא המליכני, וכה״א וידע דוד כי הכינו ה׳ למלך על ישראל (ש״ב שמואל ב׳ ה יב), היה גבור, ואמר איני גבור, היה עשיר, ואמר איני עשיר, וכן הכריז ואמר לך ה׳ הגדולה והגבורה וגו׳ (דה״א דברי הימים א׳ כט יא), ירד למלחמה ונצח, ואמר לא מגבורתי נצחתי, אלא הוא עזרני והוא הנצחני ונצחתי ויצרני להיות עושה מלחמה, וכה״א האל המאזרני חיל (תהלים יח לג) , לכך אמר ברוך ה׳ צורי המלמד ידי לקרב אצבעותי למלחמה, אימתי למד את אצבעותי, כשהרגתי את גלית, וכה״א וישלח דוד את ידו אל הכלי ויקח משם אבן וגו׳, ויפול על פניו ארצה (ש״א שמואל א׳ יז מט), וכך הוא הדרך, מי שהוא מכה את אדם מלפנים אינו צריך שיפול אלא מלאחריו, ולמה זה נפל מלפניו, אלא מלאך הלך עם האבן והשליכו בכונה על פניו, ולא עוד אלא כובע נחושת על ראשו, והיאך טבע האבן בנחשת, אלא שהיה הקב״ה עמו, לכך נאמר ברוך ה׳ צורי וגו׳. ולא הייתי יודע מלחמה אלא שמו של הקב״ה יהי מבורך הוא למדני, וכן שאול אומר לו, לך וה׳ יהיה עמך (שם שם שמואל א׳ י״ז לז), וכה״א ה׳ עמך גבור החיל (שופטים ו יב), ואומר, ברוך אתה ה׳ למדני חוקיך (תהלים קיט יב) איני יודע כלום, אלא את למדתני, שנאמר אלהים למדתני מנעורי וגו׳, וגם עד זקנה ושיבה אלהים אל תעזבני (שם תהלים עא יז יח), לכך נאמר ברוך ה׳ צורי המלמד ידי לקרב אצבעותי למלחמה. 1. A Psalm of David. Blessed be the Lord, my Rock, who trains my hands for war, and my fingers for battle (Tehillim / Psalms 144:1). Solomon said, Trust in the Lord with all your heart, and lean not upon Your own understanding. In all your ways acknowledge Him (Mishley / Proverbs 3:5-6). What did he mean by In all your ways acknowledge Him? He meant, Everywhere you go, set God in your heart before you, as David used to do. He became King, yet he would say, I am not king. The Lord is king, for He set me on the throne. As Scripture says, David perceived that the Lord had established him king over Israel (2 Samuel 5:12). David was a mighty man, but he would say, I am not a mighty man. David was a wealthy man, but he would say, I am not a mighty man. David was a wealthy man, but he would say, I am not a wealthy man. Instead, he said, no, proclaimed, You O Lord, is the greatness, and the power, and the glory, and the victory, and the majesty (1 Chronicles 29:11). David went into battle and conquered, yet he would say, Not by my own power have I conquered; the Lord helped me, and the Lord brought me victory. Yes, I conquered because the Lord so formed me that I could wage war. As Scripture says, It is God that girds me with strength of war (Tehillim / Psalms 18:33). Hence, David said, Blessed be the Lord, my Rock, who trains my hands for war, and my fingers for battle (Tehillim / Psalms 144:1). When did God train my fingers for battle? When I struck Goliath. Thus Scripture says, And David put his hand in his bag, and took a stone, and slung it, and struck the Philistine in his forehead; and the stone sank into his forehead and he fell upon his face to the earth (1 Samuel 17:49). But is this the way one would have expected him to fall? Would not one expect that a man stricken from the front would fall backwards? Why then, did the Philistine fall upon his face? Because an angel went along with the stone and deliberately threw the Philistine upon his face. No, more. The Philistine wore a brazen helmet upon his head, How could the stone have penetrated the brass, except for the fact that the Holy One blessed be He, was with David. Hence, David said, Blessed be the Lord, my Rock, who trains my hands for war, and my fingers for battle. I would not have been skilled in war, had not the name of the Holy One blessed be He, may He be blessed, trained me for war. And so Saul said to David, Go and the Lord will be with you (1 Samuel 17:37). And so it was said to Gideon, The Lord is with you, you mighty man of valor (Judges 6:12). Another comment, Blessed are You, O Lord; teach me Your statutes (Tehillim / Psalms 119:12). I would have known nothing had You not taught me, for it is said, O God, You have taught me from my youth; and until now do I declare Your wondrous works. Now also when I am old and gray haired (Tehillim / Psalms 71:17). Hence David said, Blessed be the Lord, my Rock, who trains my hands for war, and my fingers for battle (Tehillim / Psalms 144:1). The rabbis are saying that whatever we do we are to be humble and put the Lord God Almighty first in our lives. Take for example the following comparison in Mishley / Proverbs and what the Apostle Paul wrote in Colossians. Don’t put your confidence in your own understanding. Solomon writes to trust in the Lord with all of who we are, to seek His ways to find understanding, and when we do these things the Lord will direct our paths. Paul wrote we are to do all things in the name of the Messiah Yeshua giving thanks to our Father God in heaven. Comparing these verses, it is very important to understand that these verses represent the gospel message of the kingdom of God. The gospel message involves the Lord God Almighty working in our lives, conforming us unto the likeness of His Son Yeshua, and enabling us to live for Him (according to the Torah) in all of our ways. This represents the invitation to take our whole life into the kingdom of God and learn how to live the life God has given us in the power of the Messiah (i.e. the power of the resurrection in our lives). The Lord gives us His Holy Spirit to empower us to overcome sin. The overcoming nature of who we are in the Messiah is found in obedience to God’s commands and the Lord working in our lives to be able to do so successfully. When we undertake all our activities, we are not doing them on our own, we are doing them in confidence and with the expectation of the Lord working in our lives helping us. For example, if I am writing a paper, preparing for a conference, or outlining a study, I don’t do this just looking to myself, I do this in the expectation that the Lord God Almighty will help me and be there with me. any person who is not afflicted The verb is in the passive mood, and this teaches us that someone who is known not to observe this commandment properly must be compelled to fast. We may not labor, so that we will involve ourselves exclusively with repentance. Notice how important it is to be repentant during Yom Kippur (Day of Atonement). Ibn Ezra’s opinion is fasting and not working are meant to involve ourselves exclusively with repentance. To the extent that a person is not repentant, he will be cut off from among his people. Rashi says, “והאבדתי I WILL DESTROY — This expression “destroying” is employed here because Scripture uses everywhere in similar cases the term כרת, “cutting off” without clearly defining it, so that I do not know exactly what it implies; but when it states here והאבדתי, it teaches in respect of the term כרת that it implies nothing else than becoming lost” (Sifra, Emor, Chapter 14 4).” (Rashi on Vayikra / Leviticus 23:30 Part 1) Rashi claims the word כרת is in reference to becoming lost. Loosing one’s soul is a possibility according to Rashi. The Scripture states, Vayikra / Leviticus 23:32 שבת שבתון הוא לכם ועניתם את־נפשתיכם בתשעה לחדש בערב מערב עד־ערב תשבתו שבתכם (פ) It shall be a sabbath of complete rest for you, and you shall practice self-denial; on the ninth day of the month at evening, from evening to evening, you shall observe this your sabbath. This speaks of putting the Word of God first in our lives and dedicating ourselves to walking in His (God’s ways). The Lord has very high aims for you and me. His aim is that each one of us become the kind of person He can empower to do His will and to bear His testimonies. This teaches us how we are being trained and cultivated and grown to the point where the Lord God can empower us to live for Him. This is what we should be looking for in our lives. Notice how there is a lot of work that is to be done on our part before this can happen as we learn to be disciples of the Messiah Yeshua. This is the gospel message, in the death, burial, and resurrection of Yeshua, by faith we receive God’s Holy Spirit to empower us to obey His Torah. Chizkuni states, “שבתכם, “your Sabbaths.” This day has been given to the people of Israel as a Sabbath and as a holy convocation. It says: שבת לה, “as a Sabbath for the Lord,” and it also said: “a special Sabbath for you.” The former is the Sabbath on which G-d had rested from the creation. The יום השביעיpart of the Sabbath is never referred to as being Israel’s, it is always the Lord’s” (Chizkuni on Vayikra / Leviticus 23:32:6) The Shabbat is a blessing to us giving us time to draw near to the Lord and consider the mercies He has shown us and having forgiven us for our sins. This teaches us how the Lord considers the preciousness of human life (all men, women, children) by the way He sanctifies and preserves our lives. We model ourselves after the Lord and as we do this and as we walk in His ways this begins to change our relationship with God drawing us to a deeper connectedness. If you feel your relationship with God is lacking, this is how we begin to change our relationship with the Lord taking our faith to a deeper place. We begin by changing ourselves. In any healthy relationship, when we change, our partner changes. This is how the Scriptures (the Torah) describes our relationship with the Lord. The Lord demonstrated to us from the beginning how precious He considers our lives and so drawing us closer, and giving us the motivation to become exemplars of what it means to be the children of God. Discipleship means learning to acknowledge God in all we do. This takes a lot of training. This process of acknowledging the Lord in all we do, our training in this matter never is completed, but is a life long process. When we start doing this, our fears and anxiety disappear because the Lord is with us. We stop guessing ourselves and lambasting ourselves because we didn’t do it right. We get back up in repentance, seek the Lord’s forgiveness, and try again. This is the way of a loving God. Because of God’s forgiveness and mercy, we are able to take this message of God’s Messiah to the world, and to be a light to the world and salt of the earth. By walking in God’s Ways, seeking Him, His Mercy, His Forgiveness, we are able to get on with the work the Lord God Almighty has appointed us to do and to become the people that He has intended us to become. Midrash Tehillim 144 Part 1 concludes saying, “I would not have been skilled in war, had not the name of the Holy One blessed be He, may He be blessed, trained me for war. And so Saul said to David, Go and the Lord will be with you (1 Samuel 17:37). And so it was said to Gideon, The Lord is with you, you mighty man of valor (Judges 6:12). Another comment, Blessed are You, O Lord; teach me Your statutes (Tehillim / Psalms 119:12). I would have known nothing had You not taught me, for it is said, O God, You have taught me from my youth; and until now do I declare Your wondrous works. Now also when I am old and gray haired (Tehillim / Psalms 71:17). Hence David said, Blessed be the Lord, my Rock, who trains my hands for war, and my fingers for battle (Tehillim / Psalms 144:1).” Each generation of the children of God has the responsibility of passing on their faith to the next generation. As children we learn of the God of Israel and His Word from our parents and others who are older than us. Then we have the opportunity all throughout our lives to pass on what we know to others what we have learned. The Tanach describes a powerful God who created the heavens and the earth and who called a people and set them free from slavery for the sake of freedom, peace, and life. Sin negatively effects our lives that leads to illness, disease, and eventually death. Sin is unwilling to let us go except by the power of God and His deliverer (the Messiah). In the exodus story, we are told that Israel left Egypt, but they were not alone. They were accompanied by the erev rav, the “mixed multitude” that went forth with the Israelites (Shemot / Exodus 12:38). The midrashic tradition holds that some Egyptians chose to leave with Israel to strike out toward freedom and self determination. Another midrash holds that even Pharaoh’s daughter came with Israel, and in so doing acquired a new name: Batya, “Daughter of God.” The point is that the Lord God almighty would that all men be saved. He calls out to and seeks for all peoples, and He provides the opportunity to draw near, to worship, to be at peace, and to join with the people of God by faith in His deliverer. The Lord’s statutes teach us these truths, the nature of His lovingkindness, mercy, and grace towards us all. When we read “O God, You have taught me from my youth; and until now do I declare Your wondrous works,” indeed this is true. The Lord is all powerful, merciful, loving, and kind towards those who seek Him and His ways. Let’s Pray! Previous articleBits of Torah Truths, פרשת בלק, Parashat Balak, Does Seeing and Hearing really cause Us to “Know” Him?